It started with a paint job. 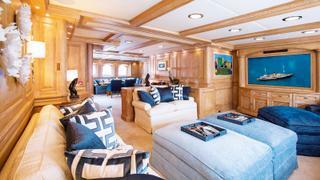 The 90.1 metre modern classic motor yacht Nero was in the hands of a new owner and in need of a refresh. She headed into MB92 in Barcelona with a humble brief but wound up becoming one of the largest superyacht refits the yard had ever undertaken. In fact, this was the biggest refit MB92 had ever done by the number of jobs alone, according to Nero’s captain, Adrian Roche. The refit required the yard to rewrite its software in order to allocate job numbers — the system only went up to 999, and the project had close to 1,400 items. As a testament to how efficiently this work progressed, Nero was out in eight months while another yacht alongside spent 18 months and didn’t even break 1,000 jobs. The tenacity to take on the work came down to the passion of Nero’s new owners, who wanted to do something special to bring the yacht up to European standards. Though they could have gone for the bare minimum and just painted the boat as planned, once the refit began they realised it was important to do something more for her. The results, and the timeframe in which the project was completed, are truly impressive. 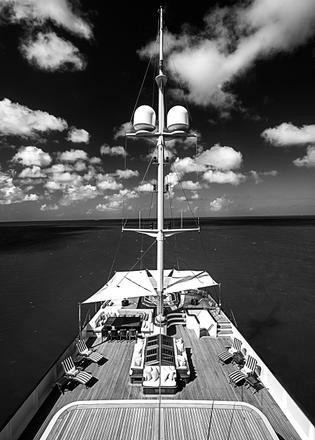 Nero was inspired by JP Morgan’s Corsair IV, commissioned and designed by Neil Taylor and launched in 2008. Taylor originally wanted to restore a true classic but when an acceptable donor yacht couldn’t be found he set out to build a replica. 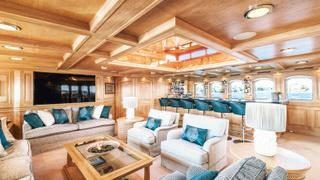 The builder, Corsair Yachts, was created uniquely for the purpose, with construction taking place at the Yantai Raffles Shipyard in China and some finishing in Turkey. 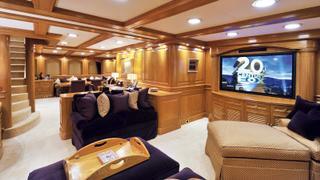 Naval architecture was by IMT Marine Consultants. The result was an all-steel, full-displacement black-hulled beauty with a sweeping sheer, pleasantly proportioned off-white superstructure and a bright yellow smokestack. Nero’s beauty won industry recognition — she claimed Best Motor Yacht Over 75 Metres at the 2009 ShowBoats Design Awards (now the Boat International Design & Innovation Awards) — and plenty of charter clients. Her new owners had experience with motor yachts but on a lesser scale. They took some time, along with their captain, to get to know Nero before diving into a refit. Beyond the paintwork and the five-year survey, just a refresh was initially planned. When it appeared that some steelwork would be necessary within the scope of the painting project, ideas began to flow — ideas geared towards improving the yacht’s liveability, functionality and charter potential. While the subcontractors that the captain had lined up at MB92 had a handle on the structural and mechanical work, Laura Pomponi of Luxury Projects was brought in to advise on potential updates for Nero’s interior. What followed was an eight-month sprint to be ready for the yacht’s debut at the Antigua Charter Show of 2016 and a winter season in the Caribbean. With the owners, crew and project team embracing the idea of “whatever was best for the boat” as the main driver in the decision-making matrix, Nero’s refit has improved on the original design and quality of the vessel. 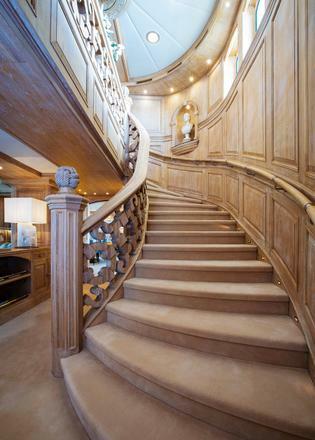 The owner’s brief for the 2016 refit was “contemporary, classic, elegance”. Nero already had two of those attributes. All that was missing was the “contemporary”. 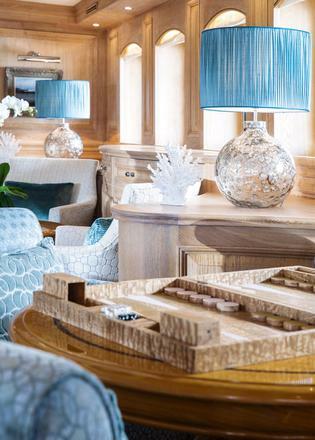 Combining the traditional, elegant looks of this stately yacht with a new contemporary interior motif was a task that fell to Pomponi. Most of the furniture and joinery was retained but modernised with a multi-step varnish removal and lime-washing process. One change would start a domino effect. With the choice to lime wash the interior, the lighting had to change as well, with LEDs creating a warming feel. “The selected LED colour temperature helps because it takes out all of the yellow effect of the old wood,” says Pomponi. The brass fittings were all painstakingly turned to silver. This meant stripping 4,000 pieces of hardware, from light fixtures to hinges, bolts and key locks. Some were dipped to resemble chrome, and those that couldn’t be treated were replaced. Nero’s brass portholes proved a particular challenge as they couldn’t be removed and were difficult to paint. Six products were tried before the right result was achieved. The final look gives a patina of age, which is arguably nicer than shiny and new. The time constraints meant a race to the finish for the interiors. Pomponi was very strategic, showing the owner only fabric options that she knew could be available by June of that year, when the upholstery job was beginning. Luckily, Nero’s owner was decisive and efficient under the threat of a looming deadline. “In one meeting, we selected almost 90 per cent of the décor,” says Pomponi, “and in two weeks we provided 1.9 kilometres of fabrics.” That’s just counting the upholstery and curtains, not even considering the pillows. The total amount of fabric on board Nero is 2.48 kilometres. Fashionable accessories in a variety of textures and a silver palette bring that contemporary feel. 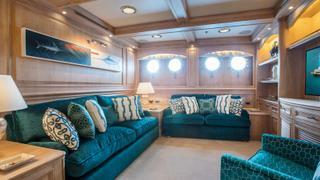 There are 70 kinds of lamps on board; all of the shades are designed by Luxury Projects and custom made. Modern art is highlighted by antique frames. 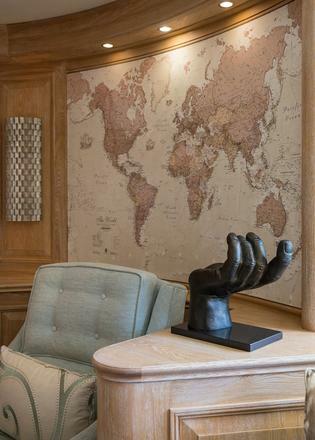 A stunning set of sculptures made to look like old books was Pomponi’s gift to the owners. In some ways, the refit to make Nero more contemporary actually made her more authentic — and certainly more usable, which fits the next part of the brief: to make her more functional as a charter yacht. The main-deck library, for instance, had faux bookshelves flanking the fireplace. They were stripped back to reveal that there were real shelves in place all along. They now contain a beautiful set of colourfully decorated classics. This formerly dark space is now light and welcoming, inviting guests to wander in for a daytime read or an evening nightcap. 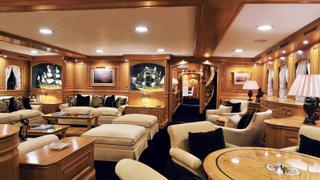 Nero’s refit also revitalised the unused identical bars on the main and upper aft decks, which were in bad condition. The marble was 10 years old and had started to break down, the icemakers and refrigerators were freestanding rather than built-in, and the cabinetry was poorly designed. Captain Roche says: “We put in functional cabinetry, brought in new chairs and upped the standard of the appliances.” The teak bar stools and outdoor dining chairs are Pomponi’s design. The chairs are as functional as they are good looking, designed to fold like pages in a book when being stored away. Feedback from previous charter clients was considered in order to improve Nero. She was already popular on the charter scene, particularly among Americans who like the retro look. 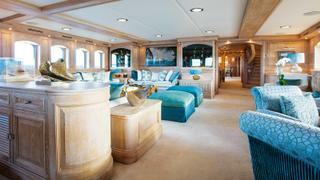 Some of her clients are older, and the captain sought to make changes that could improve their comfort. A few guests did trip in places such as the steps leading into the dining room and those near the bed in the master suite. The small steps to the dining room were removed and the floor was given a gradual incline to make the transition from the saloon easier. Nero’s refit also addressed charterers’ requests for more outdoor seating — the aft deck table has been enlarged — and more shade on the superyacht sundeck. But it also did away with some of the six dining areas. With a formal dining room on the main deck and multiple outdoor options, having a small dining table in the upper saloon seemed unnecessary. 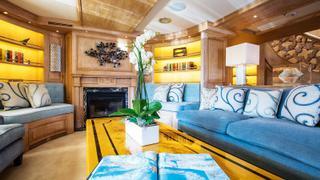 The room was redesigned with a glamorous superyacht bar as the focal point. The owners had one request: make sure that it looks as if it has always been there. The bar’s lush green marble inspired a green theme throughout this deck. Pomponi also designed the bar stools on the upper deck and had them made by Fendi. “It’s worked nicely for charters, because the principal will just tell the guests to meet at the bar before dinner,” says Captain Roche. “It adds an element of elegance.” The bar was made by the German company F List, which was able to match the wood perfectly to what was already on board Nero — the upper lounge being one of the few areas, along with the cinema, that was already panelled and furnished in a lime-washed oak. Having a crew member adept at woodworking helped to speed up the refit, as did having two crew members who were upholsterers. 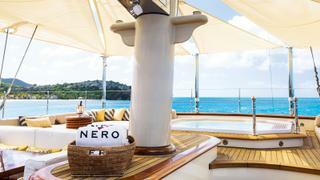 They did all the new upholstery visible on Nero’s exterior decks. The biggest crew project was when everyone pitched in to refurbish the deckheads, which were originally held in place with hook-and-loop strapping. 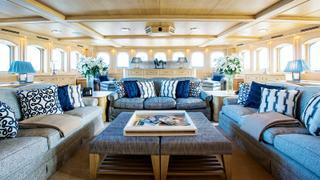 The new system, called Fast Mounts, is really the superyacht way of doing things. 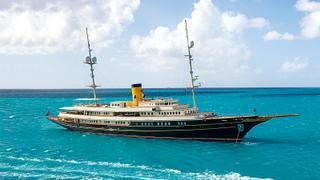 Sometimes a superyacht refit includes happy surprises, and the work on Nero was no exception. The first of these occurred in the foyer, where the dark, black and yellow floor design needed to be redone. Stripping the wood to see what came up, the team was rewarded by finding a beautiful ash, walnut and oak compass rose. Another welcome surprise was the presence of extra storage throughout Nero. “There was so much space that was unused, or just things stuffed in there from the original build,” says the captain. Nero was finished just in time for the Antigua show, cutting it so tight that crew members were finishing sewing cushion covers on the crossing. 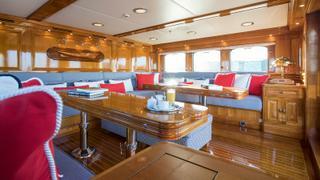 “The day before the show, we had a fully functional upholstery shop on the boat,” says Captain Roche. Pomponi flew over to dress the yacht just in time for Nero’s reintroduction, which attracted rave reviews. 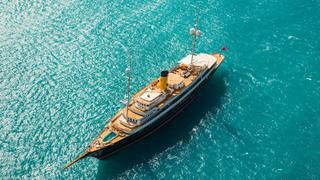 “We like to say she went from being a gentleman’s yacht to a lady of the sea,” she says.